Slippery Elm Bark can be very soothing for treating indigestion as well as, treating colitis, irritable bowel disease (IBS) and Crohn's disease. As its name implies, this lubricating and nutritious herb coats irritated areas, allowing the body to heal itself. Herbalists use it in cough medicines for scratchy, raw, sore throats and mouth irritations. Slippery Elm Bark is known to reduce inflammation of the intestinal tract. Soothing the inflamed mucous membranes of the bowel and neutralizing excess acids in the intestines, which makes it beneficial for Crohn's disease, ulcerative colitis, diverticulitis, diverticulosis and irritable bowel syndrome. It has also been used to ease constipation and chronic diarrhea. One of its oldest uses has been as a tonic for the digestive tract, its high mucilage content soothes the inflamed mucous membranes of the stomach and neutralizes excess stomach acid, making it a great remedy for the digestive system. It is said to soothe the sore feeling that often follows vomiting. Herbalists have used it as a remedy for ulcers and gastritis. Slippery Elm Bark generally reduces inflammation and is useful for soothing the mucous membranes of the urinary tract and easing the inflammation of aching joints. Midwives have used Slippery Elm Bark to lubricate and ease childbirth. 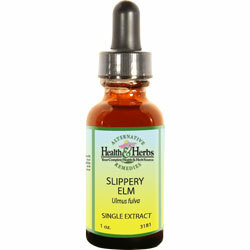 Slippery Elm Bark is a highly nutritious food product. It is good for babies as a nutritive and also benefits those babies who are unable to digest milk products. And because it is so soothing and easily digested, it is one of the few foods that will stay in a cancerous or ulcerated stomach when nothing else will and is also beneficial for invalids and those recovering from illness or who have wasting diseases. Slippery Elm Bark works with the body drawing out impurities and toxins and has been a longtime treatment for cuts, bruises, wounds, burns and also to relieve inflammed or itchy skin. Ingredients: Slippery Elm Bark, Distilled Water, 20% Alcohol. Contraindications: People with known allergies to elm bark should avoid Slippery Elm Bark. Other medications should be taken at a different time, because the herb's high mucilage content may interfere with their absorption. From Nan of Meriden, Connecticut on 8/26/2012 .